Although the UPA government is veering around to the view that it has little option but to bring the controversial office of profit Bill in its present form, it plans to hold consultations with all political leaders over the next few days before it firms up its position on the matter. Both the BJP and the Congress will face the coming Assembly elections alone. While the BJP is once again banking on Ram Lalla to bail the party out from its political wilderness, the Congress strategy may be unfolded at a rally marking the beginning of its campaign by party president Sonia Gandhi at Kanpur on August 8. In a determined effort to mount pressure on the government in the coming monsoon session of Parliament on a variety of issues, the BJP today said it would oppose the reintroduction of the Office-of-Profit Bill in its present form and move an adjournment motion in the Lok Sabha on Mumbai train blasts on July 24, the opening day. He claims to be an average student who normally scored between 65 and 70 per cent marks during his school and college days. Even as the disqualification threat looms large on CPM parliamentarians, including Lok Sabha Speaker Somnath Chatterjee, for allegedly holding offices of profit, the West Bengal Government has declined to give information sought by the Election Commission. Days after the Mumbai and Kashmir serial blasts, Prime Minister Manmohan Singh today admitted that the past responses to deal with terrorism and Naxalism have been “inadequate” and asked the states to marshal all their resources to meet the threats which are of “different intensity, magnitude, scale and scope”. The Supreme Court today expressed anguish over several states still not implementing the Justice Shetty commission report on improving the working conditions of judges in the subordinate courts and directed the Chief Secretaries of such states to ensure that the report of the panel was implemented in letter and spirit. A delegation of prominent women professionals and activists today appealed to President Abdul Kalam to pardon Gujarat riots' Best Bakery case key witness Zahira Sheikh, sentenced to one-year imprisonment by the Supreme Court for making false statement before it. District Magistrate of Gaya Jitendra Srivastava this afternoon rushed to the Buddhist pilgrimage of Bodh Gaya to make an on-the-spot investigation following reports that the famous “Mahabodhi tree” was found damaged. After the recent nationwide stir on the issue of reservation in elite institutions of education, LJP chief Ramvilas Paswan now favours reservation in the judiciary too. Talking to the media here today, Mr Paswan categorically stated that his party was not only in favour of reservation in the judiciary but also felt the need to undertake a survey on the percentage representation of different caste, creed and religion, including woman, in the Army, government service and other areas. A senior IAS officer was suspended in Andhra Pradesh today for his alleged indecent behaviour with a subordinate woman officer. Commissioner of Employment and Training K. Mangapathi Rao had reportedly been making obscene comments and harassing his subordinate staff for some time now. The ‘palki’ controversy has got murkier with the Delhi unit of the Shiromani Akali Dal urging the Akal Takht Jathedar to seek the return of the gold laden ‘palki’ from Pakistan. In a significant decision, which would benefit Himachal Pradesh and Jammu and Kashmir, the Centre today liberalised the scheme for strengthening Agriculture Marketing Infrastructure by allowing state agencies to utilise their funds for the purpose instead of relying on bank credit. Rpbert Payas, a convict serving life imprisonment in the Rajiv Gandhi assassination case today moved the Madras High Court seeking release from jail. Mr Justice K. Raviraja Pandian issued notices to the Tamil Nadu government and the Vellore prison authorities on the petition filed by him, one of the four convicts serving a life term. "Glass man" ready to enter record books. "Corporate", a misfit in the corporate world? Mumbai blast-affected street urchins neglected. Contrary to the expectations, the Union Cabinet did not discuss this Bill at its meeting today. UPA sources said another meeting of the Cabinet was expected to be called before the monsoon session of Parliament commences on Monday, to clear the Bill. In the meantime, Defence Minister and Lok Sabha leader Pranab Mukherjee and Parliamentary Affairs Minister Priyaranjan Dasmunshi will get in touch with major political leaders, especially Leader of Opposition L.K. Advani, so that they get a fair idea of the final line-up on this Bill. Except the BJP, almost all political parties support the Bill which was returned to Parliament by President A.P.J. Abdul Kalam on May 30. The sources said though the government had virtually decided to go ahead with the original Bill, good form demands that they hold prior consultations with other political parties, especially since the President had raised certain concerns over the Bill and asked Parliament to reconsider it. However, the government would also like to ensure that it is not seen to be in confrontation with the President. It could, therefore, add a rider to the Bill stating that the issues raised by President Kalam would be referred to a parliamentary panel for an in depth study. It was stated that the President’s message, in which he enumerated his objections to the original Bill, will first be placed before the Rajya Sabha since the legislation was sent to the Rashtrapati Bhavan from the Upper House. The President has sought a comprehensive and generic criterion of the office of profit and wanted that it should be applied in a clear and transparent manner across the states. He also questioned the propriety of applying the Bill with retrospective effect. According to procedures, the government will respond to this message by tabling a motion clarifying its position. This motion will then be debated and passed by the two Houses of Parliament and again sent to the President for his assent. The government is banking on the constitutional provision that the President cannot return the same Bill twice. Although the debate is yet to be scheduled, the UPA is not taking any chances. Mr Dasmunshi has already written letters to all UPA MPs of both Houses to be present in full strength till the first week of August. Meanwhile, Congress President Sonia Gandhi also consulted senior party leaders, including Mr Pranab Mukehrjee, Mr Priyaranjan Dasmusnhi, Mr Shivraj Patil, Mr Kapil Sibal and Mr Suresh Pachauri, to firm up the party’s strategy for next week’s session. They reviewed all issues which were expected to be raised by the Opposition and how best it can counter the BJP onslaught. Vice-President Kalyan Singh today announced to kick start the party’s Assembly election campaign from Ayodhya after a ‘darshan’ at the makeshift Ram mandir. While giving a definite tenor to the BJP’s poll campaign, the former Chief Minister had earlier announced the need to build the Ram janmabhoomi temple to strengthen national unity. Addressing party workers, he had claimed to be “ready to die for construction of the Ram Janmabhoomi mandir at Ayodhya which is a symbol of Hindu prestige and national pride”. The date for the inauguration of the campaign from the historic site would be announced soon. Speaking to the Press, Mr Kalyan Singh made public the party’s decision to contest on its own strength as, according to him “ alliances with all parties had been a bitter experience and had cost the party dearly”. At the same time, addressing a meeting of the Congress frontal organisations, AICC general secretary and in charge of UP affairs Ashok Gehlot asserted that the party had decided to go on its own. However, he also added that if at all the Congress decided to enter into any alliance it would do so on its own terms. Sharing the party’s preparedness for the Assembly elections, Mr Kalyan Singh had claimed to have set aside the “me and mine” syndrome as the party was looking for genuinely winnable candidates. Showing a similar preference for candidates, who can win hands down, AICC in-charge of frontal organizations Oscar Fernandes hoped that those Congressmen who had lost their deposits in the last elections would not make requests for party ticket. Adopting a resolution that spelt out some innovative ways of propagating the party message, the Congress leaders asked the activists to inform at least 10 persons of the achievements of the UPA government. They were to hold at least one jan adalat to inform the public of Mulayam Singh Yadav’s failure on every front. Similarly, both party’s are making a pro-active effort to rope in the youth. The Congress had two icons in the form of Sonia and Rahul Gandhi. Mr Fernandes admitted that Rahul Gandhi would soon play an important role in UP politics. He also announced that efforts were being made to mobilise maximum support for the eight rallies to be addressed by Mrs Gandhi in the coming weeks. Mr Kalyan Singh announced that his party would increase the quota for the youth and women. “At least one woman candidate would be given a ticket from every district”, he announced. Led by former Prime Minister Atal Bihari Vajpayee, the Opposition will march to the Rashtrapati Bhavan and submit a memorandum to President A.P.J. Abdul Kalam against the government’s “failure” on the internal security front. The party will raise about 80 issues, including price rise, FDI in retail, “insult” of Hindu deities in IGNOU textbooks, corruption and farmers’ suicides, its deputy leader in the Lok Sabha V.K. Malhotra said here today after a 90-minute meeting of its Parliamentary Party executive, chaired by Mr Vajpayee. “We will oppose the Office-of-Profit Bill in its present form,” he said. He said the Opposition would also seek dissolution of the Sachsar Committee for having asked for a count of Muslims in military and judiciary. He claims to be an average student who normally scored between 65 and 70 per cent marks during his school and college days. But this engineer from Punjab Engineering College(PEC) today broke the world record in “most birth dates memorised” in the Capital with the aid of some “scientific techniques he had acquired over the past seven years”. Biswaroop Roy Chowdhury (33) took on the current Guinness World Record of Michaela Buchvaldova of Germany by surpassing the existing record of recalling 13 randomly selected birth dates and recollected 14 birth dates and names in two minutes before mediapersons and several other people. With the primary aim of making children aware of these scientific memory techniques to provide them “a respite from the burden of studies”, he now plans to reveal them in Chandigarh on August 16. Biswaroop, whose name is already a part of the Limca book of Records as the strongest memory man of the country, carried out the feat as per guidelines set by the Guinness Book of World Records. 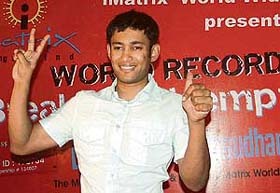 Before making the attempt, Biswaroop had contacted Guinness World Records Limited on June 22. The video footage of the event, along with other details, will now be forwarded to the Guinness for authentication. Though his personal record is recollecting 22 names and birth dates, he says today his effort was just to concentrate and break the existing world record. During the live demonstration, 22 randomly-selected persons were seated in a single row. A blind-folded Biswaroop was led before the row of 22 men and women, each of whom displayed a placard with a name and date of birth they had written on the spot. The blindfold was removed and Biswaroop tried to memorise as many birth dates and names he could in two minutes. He was then given one minute to compose his thoughts, following which he rattled off 14 names and dates of birth in order. Biswaroop, who said his attempt was not to prove his memory was the best, added it was just some memory-based techniques acquired from vedic books and other sources, along with “synesthetic power”, which helped him in the feat. He explains the meaning of synesthetic power by saying that we all use one or two senses like seeing and hearing while learning. “But if we can attach other senses like smell or taste or attach emotions to it, we can memorise things in a better way. For example the day we got our first job is an event we can never forget because emotions are attached to it. Learning to control senses and making them work at our will is the synesthetic power”. Biswaroop says he was born with ordinary memory. “ But we all have the potential for a perfect memory. There is no such thing as unsound or bad memory, only a memory bank that you can enrich and add to,” he says. Biswaroop has written 12 books on memory and claims to have invented a memory boosting mnemonic pen. He says using mnemonics, he can attach a special manning or picture to any name or number. “I can see, small, taste a name or a date…. This ability to artificially and additionally support the memory and convert it in some other form, like a picture, is mnemonics. The most important principle of memory is imagination,” he adds. Biswaroop has now thrown open the challenge to any Indian who manages to break this record by August 15. Chandigarh being the city where he spent most of his childhood, he now plans to start a training programme for children through his company I-matrix. Sources in the EC said the Buddhadeb Bhattacharya government had sent the opinion of the Attorney-General of the state, while declining to part with the information sought by the poll panel. The EC had last month sought certain details like the time since when the MPs had been holding the posts following petitions by Trinamool Congress leader Mukul Roy accusing the Marxist MPs of holding offices of profit. Sources added that the commission would now decide the course of action in the light of the West Bengal Government’s response. At a meeting of Chief Secretaries of States and Union Territories, the Prime Minister said these incidents have brought out the extent of penetration of terrorist elements. “We cannot allow them to succeed and get away with their crimes,” he said, while adding that there was a need to gear up to meet these challenges. Talking about the rising Naxal menace the Prime Minister said in the past Naxalism is “probably the single biggest challenge” to the country's internal security. Dr Singh said these threats have to be met firmly, with determination and with a will to destroy them. “You will have to empower your police forces to be able to discharge their functions at higher levels of efficiency”. Issues of good governance, red tape, right to information and implementation of development programmes also came up for discussion during the meeting. Talking extensively on the issue of internal security, the Prime Minister said the country faces the challenge of terrorism and Naxalism in many parts of the country. Observing that the implementation of various development programmes was of “vital concern” to him, the Prime Minister said the government has embarked on a large number of key programmes. These are extensive in their size and scope and have the capacity to alter the rural and urban landscapes, Dr Singh further said citing the National Rural Employment Guarantee Programme, the National Rural Health Mission, the expanded Sarva Sikhsha Abhiyan, the Mid-day Meal Programme and the Jawaharlal Nehru National Urban Renewal Mission. “The volume of funds flowing to states today are higher than ever before in the past. It is therefore necessary that these funds get translated into outcome,” he said. Noting that red tapism was a key problem faced by people when they interacted with the government, Dr Singh suggested simplification of transaction, strengthening accountability, using IT and e-governance tools and promoting behavioural changes in government employees. A Bench of Chief Justice Y.K. Sabharwal, Mr Justice C.K. Thakker and Mr Justice P.K. Balasubramanyan directed the Chief Secretaries of 12 such states to personally monitor the implementation of the report and submit the affidavits by August 31. The court, which had also suggested substantial hike in the salary of lower court judges, did not approve of the lackadaisical approach of the states. Today's direction came on resumed hearing of a petition of the All India Judges Association, filed way back in 1990, raising the issue of poor working conditions in the lower judiciary, which is burdened with crores of cases. The court also directed the Guwahati High Court and Chief Ministers of seven North-Eastern states to work out the modalities for separation of judicial powers of executive magistrates from that of the courts. It was a practice that was still continuing in some states. The executive magistrates in these states were still vested with powers to decide certain category of civil cases, as was the practice earlier in other parts of the country. Meanwhile, the court was informed by the Union government counsel that recommendations of the Shetty panel had been implemented fully in Union Territories, including Delhi, which are directly under its jurisdiction. Under the scheme, various facilities like free house, vehicle with a certain quantity of free petrol, free electricity supply up to certain fixed units, free water, free telephone, medical facility on par with MLAs and a domestic help to retired judges had been provided. These facilities had been provided in the Union Territories following a recent Cabinet decision, the court was informed. The court expressed the hope that similar steps would be taken by the state governments so that the functioning of the lower judiciary, which was pathetic in some states, would be improved. She has also been sentenced to three years imprisonment by a Mumbai special court for perjury. The apex court in its March 8 judgement had also imposed a fine of Rs 50,000 on her and said if she failed to pay the same, she would have to undergo a further imprisonment of one year. Besides, her bank accounts were also frozen by the court. The delegation submitted a memorandum to President, signed by 300 women activists, professional and academicians, including advocate Indira Jaising, actror Nandita Das, Mihir Desai, Jayanti Ghosh, Vrinda Grover, Uma Chakarvarti, Farah Naqvu, Veena Das, Usha Ramanathan. It has urged the President to grant clemency to Zahira, who had become a victim of circumstances despite losing several of her family members and relatives in the Best Bakery carnage. They requested Dr Kalam to use his constitutional power under Article 72 to grant pardon to Zahira, currently lodged in Mumbai jail. The tree is located behind the Mahabodhi temple, 100 km from here. It grew from an original banyan tree and is considered a sacred tree for the Buddhists. The Buddha is believed to have attained enlightenment under it some 2,500 years ago. The Gaya administration was reportedly informed by the temple authorities in the morning that someone had cut one of the branches of the tree. The branch was missing. The sources said the incident was likely to have international repercussions once the administration was sure of the veracity of the allegation by the temple authorities, following investigation, as Buddhists from all over the world travel to Bodh Gaya to worship this tree. State Home Secretary Afzal Amanaullal, along with experts from the Agriculture Department, would fly down to Bodh Gaya to inspect the tree. The DGP, Mr Ashish Ranjan Sinha, would visit the site tomorrow. Chief Minister Nitish Kumar reportedly has asked the administration for a detailed probe into the episode. After the recent nationwide stir on the issue of reservation in elite institutions of education, LJP chief Ramvilas Paswan now favours reservation in the judiciary too. Talking to the media here today, Mr Paswan categorically stated that his party was not only in favour of reservation in the judiciary but also felt the need to undertake a survey on the percentage representation of different caste, creed and religion, including woman, in the Army, government service and other areas. He argued that the survey would enable one to have a first hand account of how "social justice" could percolate to different segments of the society after 58 years of independence. CPI general secretary A.B.Bardhan and state CPM secretary Vijay Kant Thakur sought to prevaricate a reply on the issue stating,"We have not come here to debate on reservation". The purpose of this press conference primarily was to announce the 'kranti' (revolution) against the ruling NDA in Bihar on August 9 in the form of a joint rally by the LJP and the Left Front. A senior IAS officer was suspended in Andhra Pradesh today for his alleged indecent behaviour with a subordinate woman officer. Commissioner of Employment and Training K. Mangapathi Rao had reportedly been making obscene comments and harassing his subordinate staff for some time now. Protesting the lewd behaviour, the women employees boycotted duties, held dharna in front of his office and lodged a complaint with the AP Women’s Commission yesterday. The government ordered his suspension following a recommendation by the AP Women’s Commission. The government also ordered a departmental inquiry into the allegations against Rao. One of the victims, who is an assistant director in the department, had also lodged a complaint with Chief Secretary T.K. Dewan and also petitioned Chairperson of the Women’s Commission Mary Ravindranath about the obscene and suggestive behaviour of Rao during the past two months. “The palki is lying in Gurdwara Nankana Sahib and has not been installed at the requisite place. With allegations flying thick around it, Akal Takht Jathedar Joginder Singh Vedanti should urge the Pakistan authorities to return it,” Mr Avtar Singh Hit, president of party's state unit said. He said the Pakistan Sikh Gurdwara Management Committee and other authorities there had left it to the Akal Takht Jathedar to take the final decision on the ‘palki’. Mr Avtar Singh said the Akal Takht Jathedar should seek its return to verify the claim by Pakistan Prime Minister Shaukat Aziz that only 1.5 kg of gold was found in the palki contrary to the claims made by the DSGMC that it was more than 10 kg of the yellow metal. “The community wants to know the truth and it can be known only if the palki is brought to India,” the Akali leader said. He alleged that the Sarna brothers had not informed the DSGMC about the quantum of money collected in the name of palki. Under the existing guidelines for the Central scheme on “development/strengthening of agricultural marketing infrastructure, grading and standardisation”, assistance under the scheme was credit-linked. Under the revised guidelines, respective state government agricultural marketing board/state agencies would be permitted to utilise their funds in lieu of bank loans for financing projects under the scheme, Information and Broadcasting Minister P.R. Dasmunsi told reporters after a meeting of the Cabinet Committee on Economic Affairs. It also decided to allow projects located in hill states of Uttaranchal, Himachal Pradesh and Jammu and Kashmir to be eligible for higher subsidies admissible for hill areas, irrespective of the altitude at which a project might be located. Rpbert Payas, a convict serving life imprisonment in the Rajiv Gandhi assassination case today moved the Madras High Court seeking release from jail. Mr Justice K. Raviraja Pandian issued notices to the Tamil Nadu government and the Vellore prison authorities on the petition filed by him, one of the four convicts serving a life term. Payas, a Sri Lankan Tamil arrested for his involvement in the plot in the second half of 1991, in his petition stated that he was “entitled to premature release” after 14 years under the guidelines and policies of the state government, but his representation in December, 2004, had not been considered by the authorities. Rahul Mahajan, son of slain BJP leader Pramod Mahajan, today got a temporary relief with the Delhi High Court staying his brain-mapping test ordered by the trial court in the drug-snorting case.